Are you looking to improve your business English? Then this class is for you! We have teamed up with Dialogue Review to share one of their fascinating magazine articles and, of course, teach you some English vocabulary. To read the full article or download the Dialogue App (for free! ), head on over to their website. There are basically two types of person: one that believes that there are two types of person, and another that doesn’t. Despite having reservations about over-simplistic categorization, there are some theories which carry both practical wisdom and managerial relevance. 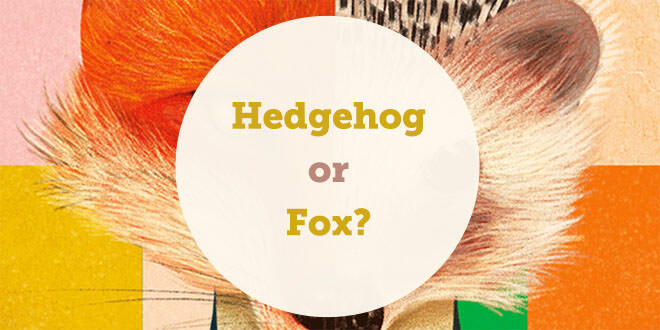 One of the inspiring ones is the distinction between hedgehogs and foxes made by British philosopher Isaiah Berlin. He distinguishes between people who strive for a coherent world view with logic and an organising principle (hedgehogs), and others who are comfortable with loose ends and with not relating things systematically to a bigger picture (foxes). In essence, this animal metaphor describes fundamental differences in human beings, concerning their preferences regarding organising and processing information and experience. Above all, it teaches us not to blame others for not seeing the world “correctly”. The metaphor, instead, urges us to respect different styles of relating to the world around us. Referring to the famous line by ancient Greek poet Archilochus: “The fox knows many things, but the hedgehog knows one big thing”, Berlin identified a number of writers and thinkers as hedgehogs and foxes. He sees, for example, Dante, Nietzsche and Hegel as hedgehogs, while he considers Shakespeare, Goethe and Molière to be foxes. A starting point could be self-assessment with the HedgeFox tool, which we recently developed; please contact the authors for further information. Self-awareness not only fosters an effective use of one’s unique skills, it increases managers’ sensitivity towards individual style in general. When it comes to strategic decision making, knowing one’s individual style preferences is crucial for team composition or staff selection. We also developed a management tool (the Public Value Scorecard) to help team members with diverse styles to find a common language. In other words, we enable the fox to put his ideas in a nutshell, and we try to stimulate the hedgehog to open up to more than his or her perspective. But let us also be pragmatic: there is no need to change your innate “foxiness” or “hedgehogness”, or to apply new tools in order to profit from it already here and now. Opening yourself up towards more hedgehog- or fox-like characteristics is fruitful, but should not be at the expense of losing your authenticity. Be who you are. We hope you enjoyed this article! What do YOU think? Remember, you can read the full article and magazine on the Dialogue Review website for free.